Trying to choose where to get your next mattress? Looking for the best deals and discounts? 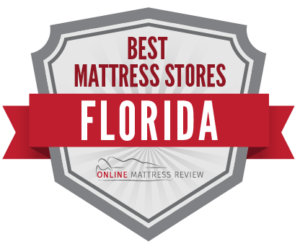 We’ve put together this guide to help you find the best mattress shops in Florida and to make your decision easier. After a day in the sun in the Sunshine State, you are probably looking to get the best night’s rest you can. There are many great options for mattresses all across the state of Florida. In today’s market, you can gain mattresses that are increasingly affordable or expensive. Whether you’re looking for organic all natural fibers, memory foam, or something to help you complete the furnishings in your beach house, there is something for all price point throughout the state. Major cities like Miami and Orlando have a vast number of mattress stores and more locally run mattress shops to choose from. You can find mattresses made with sustainable materials and packaging, mattresses shipped to your home, and mattress and frame sets set up in your own home. In other parts of Florida, there is no shortage of mattresses. We selected some of the top ranked shops to help you narrow down your selection. Check out our individual city pages within the state, or a run down of mattress store offerings by region below. There are many quality and affordable mattress stores in Southern Florida. We consider Miami, Fort Lauderdale, and Fort Myers, FL among some of the largest suppliers of mattresses in the Southern Florida region. Mattress stores in Miami offer a wide-range of mattress including some great organic options. The highest rated mattress store in Miami, SEB Mattress, offers mattresses free of harmful chemicals and includes Naturepedic mattresses. You’ll find SEB at 3701 Grand Ave in Coconut Grove WH Area. Some of the other top ranked mattresses include Brickell Mattress (1030 SW 8th St.) Mattress Firm Midtown (3101 N Miami Ave), and Miami Discount Mattress known for just that- trustworthy and comfortable mattresses offered at an affordable rate. You can find them at (108 NW 14th St.). If you’re asking for where to buy affordable mattresses near Fort Lauderdale, you won’t have to look far as a number of mattress stores in Fort Lauderdale offer quality mattresses for a reduced price like Florida Mattress Discount located at 7118 Stirling Rd- a mattress shop near Fort Lauderdale in Davie, Florida. Mattress Firm is King with Several locations in and near Fort Lauderdale. But one of the top ranked mattress shops in the area is Mattress Xperts (3801 N. Federal Hwy). Perhaps the king of discount mattresses comes in Fort Myers on the opposite coast of southern Florida. Mattress Firm Clearance (13140 Metro Pkwy), Furnish N Save (1971 Dana Drive) and Half Price Mattress and Bedroom Outlet all rank highly for their affordable and discounted mattress options. You may be asking yourself “Where can I find a mattress in Orlando?” With so many mattress stores to choose from in this large metropolitan area, it may be difficult to discern the best. If you are looking for good quality and affordable mattresses we recommend taking a look at The Original Mattress Factory located near Orlando in Winter, Park Florida (1785 State Rd. 436). Here you will find quality customer service and mattresses for a great affordable price. Othe great options include the Mattress Firm in downtown Orlando (4194 Conroy Rd), Mattress Firm Clearance in the Colonialtown Center at (3748 Colonial Dr.). Some of the smaller shops selling mattress in or near Orlando include Mattress1One (7339 W Sand Lake Rd) and Mattress Domain (7050 W Colonial Dr). If you’re looking for where to buy mattresses in Tampa, you will find a number of option for all price points. Bed Pros Mattress offers factory and close-out prices as well as affordable mattresses that were overstocks. They are located at 145 S Dale Mabry Hwy. Famous Tate Appliance and Bedding is much loved shop in Tampa located at the intersection of W Water’s Ave. and N. Armenia Ave (8316 N. Armenia Ave). This is a customer-centric friendly locally run mattress store. Other high ranked shops includes Mattress Firm Walter’s Crossing (1526 N Dale Mabry Hwy, Mattress Firm Soho in South Tampa, and Mr. Furniture- another great option for affordable mattresses (14975 N. Nebraska Ave). Wondering where to find a mattress shop in Jacksonville? Jax Mattress is located Southside (6285) and offers great customer service and high quality mattresses for all price points. Mattress Firm holds four locations across Jacksonville. Beds Beds Beds is a family-run mattress shop located in Jacksonville. You will be impressed with the personal touches and individualized attention. If you’re headed to Tallahassee, you may be seeing the beauty of the swampy surroundings or more likely finding a new apartment new FSU. Finding a great mattress shop is a cinch in Tallahassee whether at The Sleep Gallery (711 N. Monroe St.), Tallahassee Furniture Direct (2855 Industrial Plz Dr) or Capital Discount Bedding <1901 N. Monroe St.). Whether you're furnishing home or vacation home, you are probably going to asking yourself- "Where can I find a mattress store in Pensacola?" Pensacola is not short on options including the beloved Ashley Home Store (6863 North 9th Ave) or Sleep Number at 1550 Airport Blvd. Lindsey's Suite Deals, Mattress Now (12011 Panama CIty Beach Pkwy) and America's Mattress (13800 Panama City Beak Pkwy) are all great choices if you are looking for a mattress in Panama City. You’ll be able to find mattresses in all of the major population centers of Florida. We’ve listed the top 30 here: Miami, Tampa-St. Petersburg, Orlando, FL, Jacksonville, Sarasota-Bradenton, Cape Coral-Fort Myers, Palm Bay-Melbourne, Port St. Lucie, Palm Coast-Daytona Beach-Port Orange, Pensacola, Kissimmee, Naples, FL, Lakeland, Tallahassee, Winter Haven, Fort Walton Beach-Navarre-Wright, Gainesville, Deltona, North Port-Port Charlotte, Ocala, Sebastian-Vero Beach South-Florida Ridge, Spring Hill, Panama City, Leesburg-Eustis-Tavares, Lady Lake-The Villages, Homosassa Springs-Beverly Hills-Citrus Springs, St. Augustine, Zephyrhills, Sebring-Avon Park and Titusville, FL.